Inhale the scent of victory with the Paco Rabanne Invictus Deodorant stick, a twist-up stick that will refresh the skin, and protect it from sweat and odour. 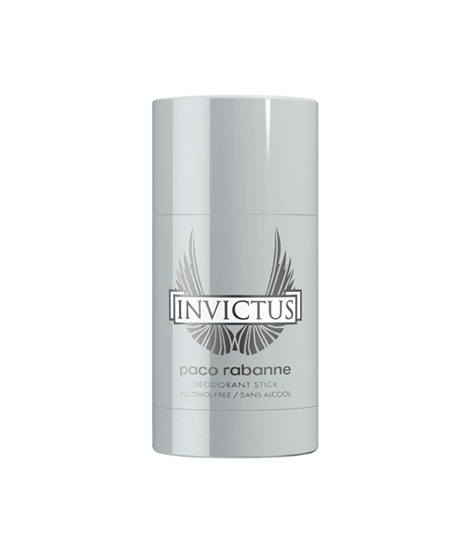 The Deodorant Stick is scented with the aroma of a true champion, the Invictus fragrance, an uplifting and invigorating aroma that captivates everyone in its wake. The Invictus fragrance is a battle of sensations with fresh notes of grapefruit and marine accord intertwined with patchouli and ambergris. Apply under the arms at any time of day for long-lasting protection.